If you’re wandering around a theme park such as Disneyworld, Six Flags, or downtown Chicago, you’ll want to make sure your shoes fit right. Blisters are not fun, and while you may have fun while earning them, they’re certainly not fun to have for the next few days. Gym time or not, blisters cause too many problems to take lightly. So read up here on how to get rid of them! Basically Blisters form when your skin is rubbing against something. They are fluid-filled pouches that are created in order to add some cushion and get you through the problem. However, if they’re shoes, or hands when raking, those troubles will make the blisters worse and more painful. Especially when the pop. So read on, that way your life will be a little less miserable. You can prevent blisters, or stop them from getting worse if you’ve already got them, if you use Blister Plasters. They absorb moisture that builds up in the blister and which then causes you pain. These plasters are made by folks like Dr. Scholl’s, and you can find them at a variety of different places. I know it’s tempting to poke at it, but if you leave it alone it will heal faster, especially if exposed to air. Not touching the blister, especially if it pops, will help prevent an infection. Put rubbing alcohol on both the blister and the needle to disinfect it. Pop the blister gently, and push out the liquid. Clean the popped blister, and then dry the area carefully. Put on some antibiotic cream to help ensure the lack of an infection. Put on a loose bandage, forming a cover over the blister, but not really touching it. If you get blisters when wearing high heels? Don’t wear ’em. If you get blisters on your thumbs playing Smash Bros.? Put it away for a while until the blister heals. Note your behavior and change it to help the blister heal. Don’t touch the blister! We’ve talked about that before. But as it heals, it may become really difficult to not touch. They’ll become itchy, and sometimes red. If you scratch it, it’ll make it worse…use the cold washcloth or cold soak to help relieve the itch. 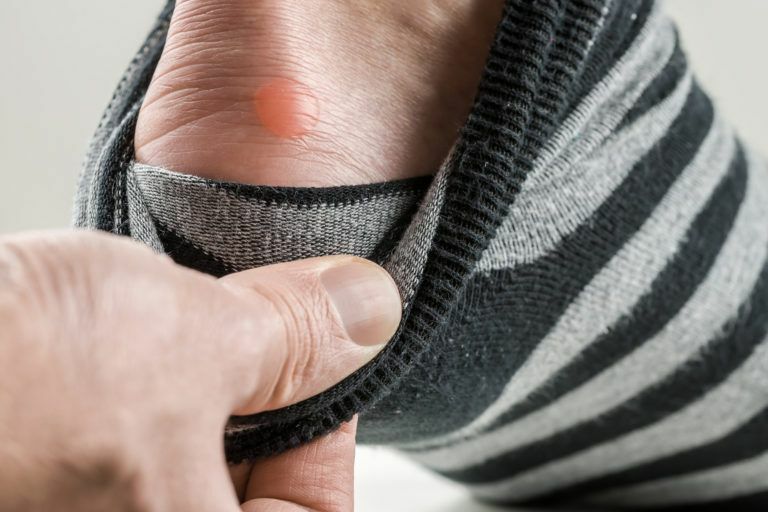 Blisters CAN get infected, and in a few rare cases serious infections will happen. Watch for increasing pain, yellow or green and smelly pus, fever, and red streaks coming off the blister. These are all signs that things ain’t right, and you should get it checked by a doctor. If clothes/shoes fit properly, they won’t rub when you move. If things don’t rub, then there isn’t the reaction that causes a blister. So look for breathable clothes, snug fitting shoes, and things that work for you when you exercise or move around. Gloves will sometimes help when gardening or raking. However, if they’re loose, they could cause more blisters than they help. What I do is put on a few strips of electrical tape (especially between thumb and pointer finger). Then if the glove rubs against the hand, it rubs against the tape not the skin. This helps me prevent blisters. Weight lifting tape may do the same thing. If you’re sitting around in wet clothes because you sweat a lot when working out, then changing into dry ones is necessary. The added moisture can cause the friction that causes the blister. Get out of sweaty or wet shoes, clothes, socks, gloves. Use a handkerchief or towel to wipe your hands and equipment when working out or doing repetitive stuff. Listen, Gold Bond is amazing. You don’t often hear about it unless you’re over 30, but man. It helps dry areas out that would otherwise chafe or rub and cause blisters. If your feet sweat a lot, there’s also foot powder, talcum powder, or cornstarch that will help dry them out. My recommendation would be to use gold bond after showering and drying the feet. Gold Bond Medicated Powder (sold at Amazon) is a brand you may want to consider. Blisters will happen, especially if you exercise for a long time. Avid runners will get blistered feet, golfers will get blistered hands. The advantage is that after a while, calluses will build up. However, if you don’t want that hassle, taking breaks frequently will help cool off and dry your appendages. Exposing a blister to air helps because it wicks away the moisture and lacks anything rubbing on the already aggrieved skin. It’s cheap, too! This smells nice AND will relieve pain if you put a couple drops on the blister. This will help protect the blister by creating a bit of a barrier over it. It’ll stop extra friction from causing issues. You can find petroleum jelly, aka Vaseline, from Amazon.